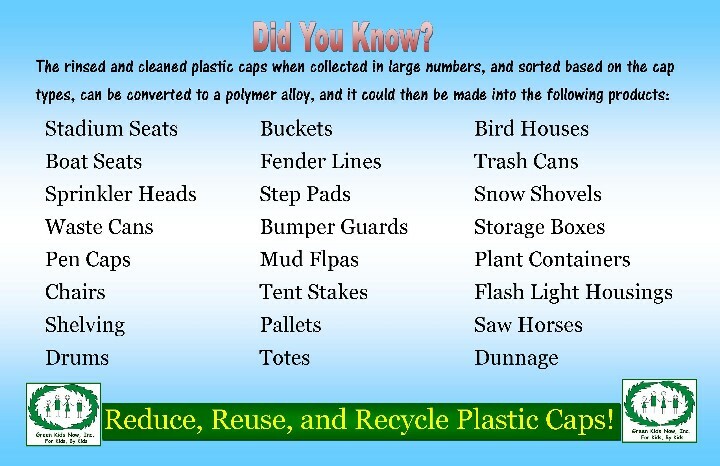 Plastic Caps Recycling - Green Kids Now, Inc.
Project Goal: To recycle all the valuable Polypropylene & Polyethylene plastic caps, and prevent it from ending up as litter in our landfills and in our oceans. The project began with our awareness campaign through various Medias – such as TV interviews, in-person presentations, news articles, blogs, social media, web advertising, art exhibits, community events, and so on, has reached thousands of people. We are very happy with our awareness outreach efforts! We were able to collect about 300 lbs. of plastic caps. Plastic caps are very light weight, so this is a huge amount of caps that were 100% recycled and diverted away from the waste stream. However, the community participation is very low, mainly because of the “leave the caps on” messages from the curbside recycle collection. 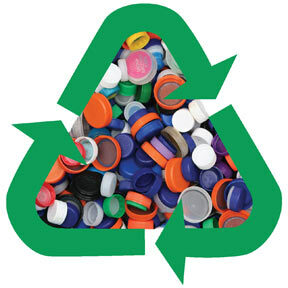 As we had mentioned from the beginning of this campaign, “leave the caps on” process has resulted in only about 10% of the caps being recycled, and it is not a complete solution. 90% of the caps are still being wasted. Challenge we face: Recyclers need thousands of pounds of caps to run through their machines, and our collection was not sufficient for recyclers to process. While this program did not succeed to our satisfaction, and the manufacturing of mixed materials and recycling challenges continues, we are not discouraged and are focusing on building more responsible innovators so we can address environmental issues right at the source through our 3 new R’s – Rethink, Redesign, Restore with environmental sustainability in the core, and educating how to adopt biomimicry and green chemistry into development of products and solutions. Join us in our continued efforts, and support us to build many responsible innovators! Plastic Bottles and Caps are NOT made from the same type of plastic. Here’s an example: Polyethylene terephthalate (PET), or plastic #1, often comprises plastic bottles while polypropylene (PP), or plastic #5, often makes up the caps. Though #1 and #5 are still plastics, they have a different melting point, with a difference of nearly 160 degrees Fahrenheit between the two. If caps get mixed in with bottles, the entire batch may be ruined because there is un-melted plastic in the mix. 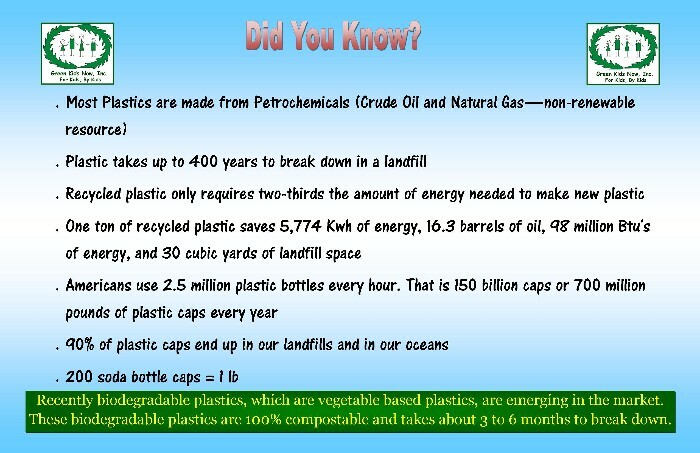 All plastics go through the same recycling process. They’re sorted, baled, screened to remove contaminants, washed, ground into flakes, separated from contaminants, dried, melted, filtered and formed into pellets. This is an expensive and time-consuming process, and recyclers want to make sure it’s worth it financially. Markets for different types of plastic vary around the country. it’s easy to infer that there’s a larger market for PET, which has a recycling rate of nearly 30.8 percent, than PP, which has a rate of less than 11 percent (based on 2012 APR report). So, if your city does not accept bottle caps, it could be because the benefit is not large enough to support the cost. Marine pollution statistics shows that the plastic caps are one of the top 10 materials causing pollution and plastic caps litter has become a huge environmental hazard. 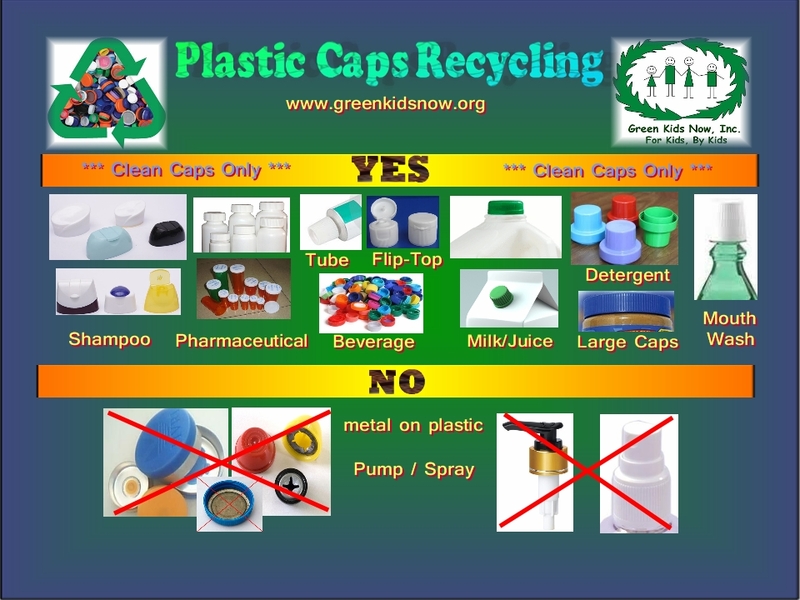 So, Green Kids Now organization has decided to raise awareness on this issue, and encourage people to responsibily handle the plastic caps. 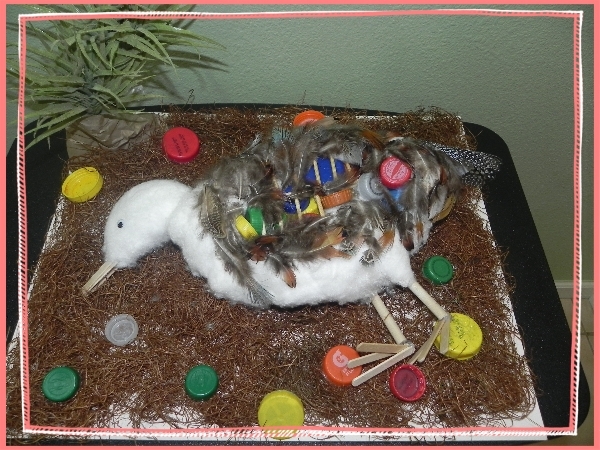 Pavan wanted to raise awareness on this issue, and started the “Plastic Caps-an environmental hazard” project. He partnered with many other kids to collect plastic caps in their schools and homes since October 2012. 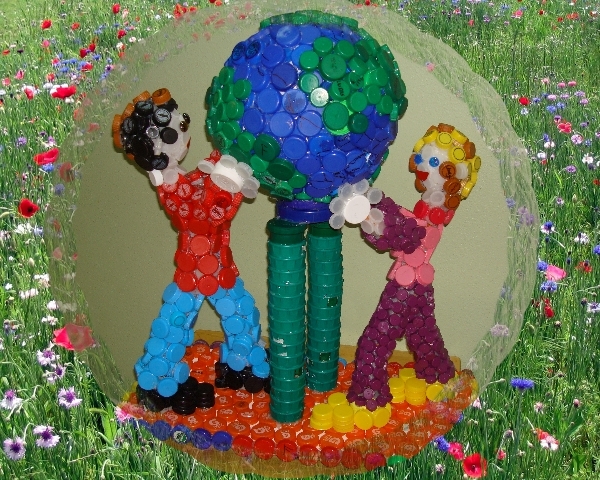 The kids made a sculpture using plastic caps to raise awareness on this issue. 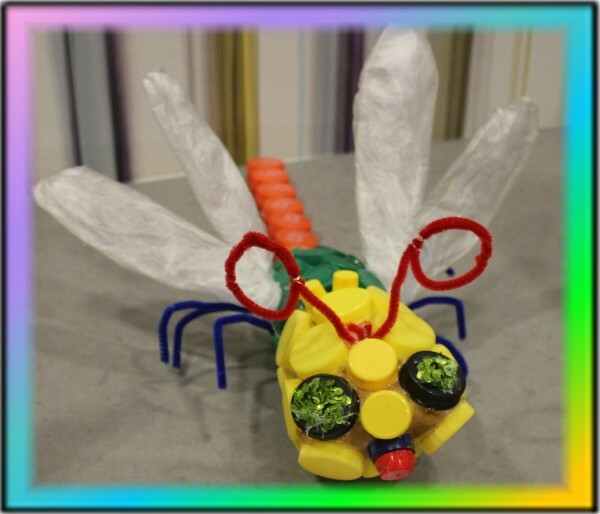 Please see this short video presentation by kids at the Green Kids Conference on this topic. So what Green Kids Now is doing is directly helping to reduce Plastic Caps litter. 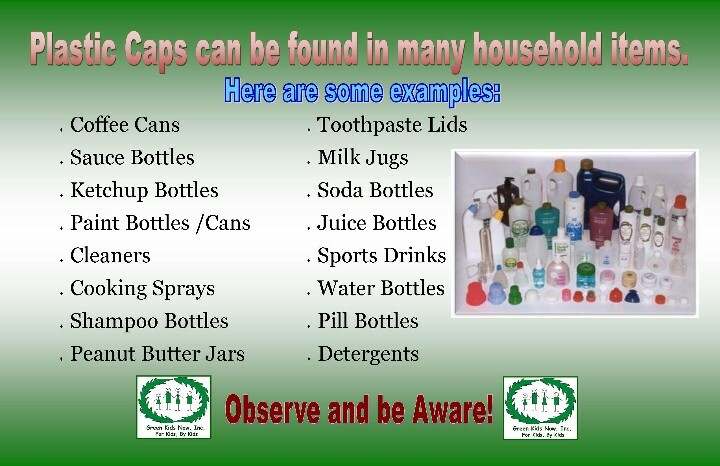 We are placing plastic caps collection bins at various locations. The collected caps, will be separated and sorted into Polypropylene and Polyethylene with the help of volunteers, and then store it in the storage location, until we reach close to 1500 lbs and then transport it to AHG Recycling located in Newark, CA, to be shredded, which would then be used to create new plastic products. The shredding machine requires loads about 5000 lbs at a time, but AHG Recycling was kind enough to help us store large quantities in their location until it reaches the right amount (~5000 lbs) for processing. Project Mission: To raise awareness about the environmental hazards caused by the plastic caps, and encourage citizens to voluntarily take action by participating in this Plastic Caps Recycle Project. We are seeking support and partnership from Community Groups, Non-Profits, Educational Institutions, and Businesses to help with this project. We will need volunteers one day every month to sort, and package the caps for storage/shipping. We will have a volunteer roster started soon, and would like to sign up 20 to 30 volunteers (adults and kids) every month. a) We need financial help to cover the basic necessities, such as, shipping, flyers printing, recycle bins, Gaylord boxes, recognition awards, etc. 4. Provide us with a room or shed, for storage and sorting place. b) The sorting area could be a temporary place which we could use once a month for volunteers to meet and work. At the end of the volunteer day, we will transport all the sorted caps either to the storage location or to the recycler. Help us with awareness campaign. Please ensure the plastic caps are relatively clean. 2. City Office building – 39550 Liberty St.. Fremont, CA – 94538. (Drop-box located behind the steps on First Floor) – Mon to Fri business hours. 1. Niles Discovery Church – 255 H Street Fremont, CA – 94536 – Monday-Wednesday, 9:30-3:30. Second Saturday of the month, noon-1:30. 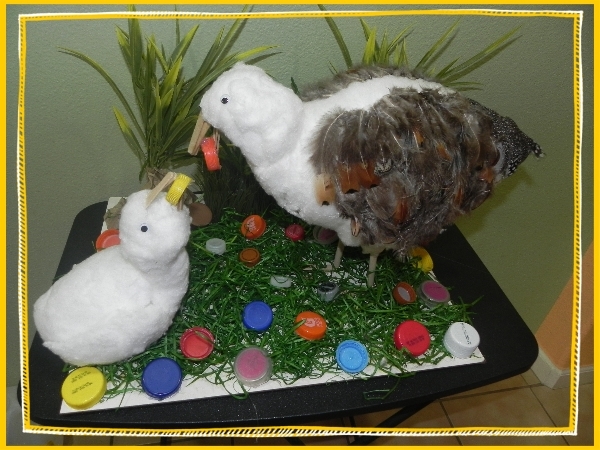 “Save Our Planet” – artwork created by Prashanti Arts Inc., and Green Kids Now, Inc.
“Albatross Nest” – artwork created by Green Kids Now, Inc.
“Dead Albatross” – Artwork created by Green Kids Now, Inc.